A rapidly growing BT contact centre in Doncaster, which employs more than 700 local people, is celebrating its 20th anniversary. 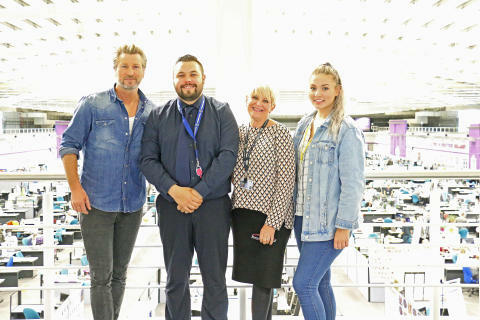 The centre – which handles nearly 2.7million calls a year and carries out a wide variety of work, including customer service and sales of products such as broadband, TV and BT Sport - celebrated its milestone birthday with a visit from BT Sport football expert and former Wales midfielder, Robbie Savage. Robbie Savage cut a cake to celebrate with the centre workers, toured the site at the Lakeside Business Centre and took part in a question and answer session with the people working there as well as posing for some selfies and handing out signed photos. The contact centre has a come a long way since it opened in 1997 and is growing all the time with around 65 people already recruited in the past six months. Recruitment is ongoing with around 100 further positions set to be filled in the next six months. This includes around 30 apprentice roles. The last 20 years has seen lots of famous faces visit the centre including Brian O’Driscoll, Martina Navratilova, Martin Keown, Ed Miliband, Clare Balding and Lawrence Dallaglio, as well as famous football silverware such as the Champions League Cup and the Premier League trophy. The contact centre has also been used for charity telethons, such as Children in Need and Red Nose Day, with around 120 BT volunteers from the region giving up their time to answer phones each time. Even Pudsey Bear in his famous yellow spotty attire has visited. In 2015, Doncaster was also chosen as the base for a team of highly trained advisors to look after BT’s more vulnerable customers. These customers may have a serious illness, such as dementia, or a physical or mental disability, which require advisors to have specific knowledge and understanding of how best to help them. Doncaster was chosen because of the wealth of expertise and experience among the workforce. One person who has been at the centre since the very first day is Michael Januszkiewicz. Michael joined fresh out of sixth form at just 18 years old as a telemarketer taking sales calls. He now designs and delivers training courses across BT, training both new and existing advisors as well as new managers and other trainers. Michael said: “I absolutely love my job and have enjoyed a steady career progression during my time here. From making that first customer call myself I now train and prepare today’s new starters for their first calls. You can definitely carve out a long term career here and I’d hazard a guess that in another 20 years I’ll still be here. I certainly hope so. “The centre has changed massively over time, not only in terms of technology and the décor, but also in the products we sell and the support we provide to customers. I can still remember the calls coming in from people desperate to know when they could order broadband for the very first time. Now customers want superfast broadband, BT Sport, TV packages and mobile phones all in the same call. Todays’ advisors certainly have a lot more to remember. Deborah Anderson, general manager of sales at the Doncaster contact centre, said: “I'm really proud of everything that the teams in Doncaster have achieved over the past 20 years and I'm delighted that they have reached this impressive milestone. Nearly 6,600 people are directly employed by BT and its EE business in Yorkshire and the Humber – equivalent to one in eight employees working in the region’s IT and communications sector. In South Yorkshire, this figure is around 2,900 people. For recruitment opportunities at the Doncaster contact centre please visit www.btcontactcentrejobs.com.